A couple days ago, a friend told me she was making chicken soup and invited me over. Much to my dismay, she was pouring a carton of chicken stock into a pot and throwing some random things from her refrigerator into the pot. I do like making everything from scratch, if not for the challenge but to procrastinate just a teensy bit more, but chicken soup is one thing I will never eat out of a box, a can, or otherwise. I cringe at the thought of pre-made soup, and I cringe at restaurant made soup too. I just don’t like the idea of someone else making my soup. This chicken soup is a little riff on what my mom used to make us as kids. It’s easy, and all you have to do is put it all in the pot and walk away until it’s just beautifully fragrant and delicious. I use chicken legs for this because I dislike using whole chickens, but you need some bones to boil to get that delicious and silky quality to your soup. Simmer on medium to low heat for 1 hour (I normally put this on the stove and then go for a walk, pick up some bread and come home). Remove the chicken and bones. 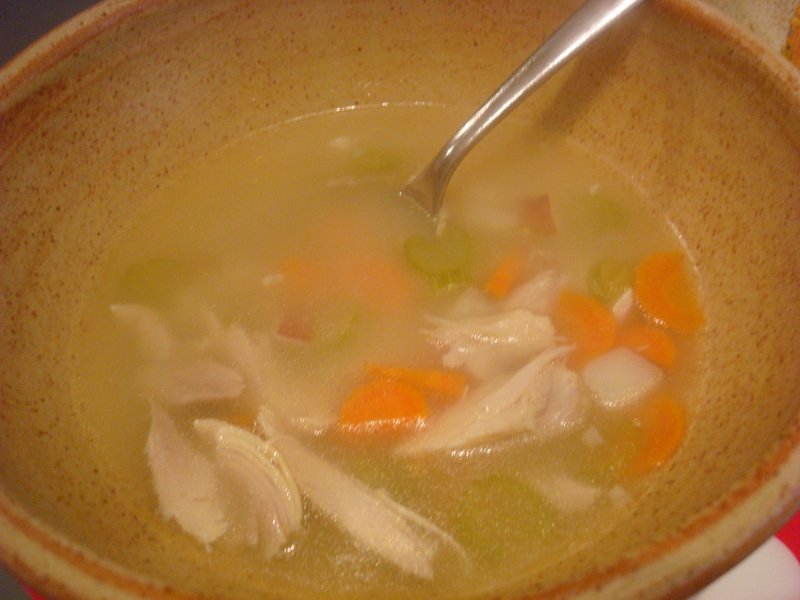 Discard the bones and shred the chicken meat into a bowl. Bring to a gentle simmer and drop in the potatoes and cooked chicken. Boil for 5 minutes before adding the rest of the vegetables. I like crunchy vegetables, so I let everything percolate for only 2 or 3 minutes more before I serve… but feel free to cook the vegetables to your liking.